I went to three restaurant openings this week, all on Wednesday, and all in the course of about two hours. I started on the really touristy part of Bleecker Street, between Thompson and LaGuardia, at the "green carpet" opening of a place called Otarian. The ‘O’ in the name is meant to represent Earth. Because it’s round. "Tarian" comes from words like "vegetarian." So the whole name is meant to indicate that people who eat there care about the planet. The food is "low carbon cuisine." Pretty much everything we eat is actually very high in carbon, except for the inorganic compounds salt and water (sodium chloride and dihydrogen oxide), which don't contain any carbon. Fats, proteins and carbohydrates, the three main components of everything we eat, are all made from carbon-based molecules. Carbohydrate, if you remember your chemistry class, means carbon, hydrogen and oxygen. Fats, or, more precisely, fatty acids, are carbon chains with hydrogen atoms hanging off of them. Proteins are chains of amino acids, which are in turn complex groupings of carbon, hydrogen, oxygen and nitrogen. Unless you're just sitting around drinking salt water, you’re not consuming low-carbon cuisine. But I know what they mean. 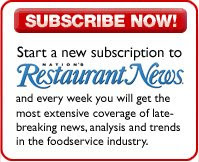 It’s low-carbon-footprint cuisine, and Otarian claims to be the first global chain with carbon footprint menu analysis. Except, according to its web site, it’s not a chain at all. The Bleecker Street unit was the first of four restaurants listed on the site, but the only one that has opened yet. Where I come from that’s not a chain. That’s a restaurant. Where I come from that's not global. But they did get a good turnout for the opening party. They offered to send a hybrid car to my office to bring me there, but I told them I’d use a greener conveyance, the subway, which I did. I walked past the paparazzi who were busy photographing Vanessa Williams (I don’t know why she was there, but the publicists did promise that the event would be star-studded) and got a green tea Mojito from the bar. Then I spotted nutritionist extraordinaire and occasional party-goer Marion Nestle from New York University. She had just arrived from out of town and said she would have accepted the party host’s offer to pick her up at the airport, but she got the e-mail too late. We both wondered why they wanted us at the party so badly and chatted about the big food news of the week, KFC’s introduction of the Double Down — two breaded chicken breasts sandwiching two slices of cheese and two pieces of bacon. There’s a picture of it at the beginning of this blog entry. The anti-fast food crowd has declared the item a travesty. Sam Sifton called it "disgusting,” which isn’t very nice, but at least he tried it. If he found it disgusting, then that’s the way it goes. Other people, especially those commenting on Marion’s blog, figuratively threw up their hands in disgust without going near the thing. That’s not just rude, it’s stupid. (Read their comments; with a few exceptions I’d call them retarded, but retarded people generally don’t continuously carp about things about which they’re ignorant). Marion said she didn’t know what the big deal was. It’s comparatively low in calories for fast food, and as Marion argues all the time, the biggest problem with the American diet is that we eat too much. It all comes down to calories, she says. It doesn’t matter whether the calories come from fat or carbohydrates or protein, what matters is that we’re in the grip of an obesity epidemic, and people gain weight because they consume more calories than they burn, regardless of where those calories come from. The people from Otarian were sure that Marion would love the place, which is not just low-carbon-footprint but vegetarian, and they were thrilled to have her there. Marion told me that whether it was nutritious or not all depended on what they did with those vegetables. Otarian’s a fast-casual place, so it has a menu board. But we couldn’t get close enough to read it because Vanessa Williams and a throng of people who wanted to be near her were in the way. I did sample a mini-burger that tasted like it was made from falafel. It didn't seem particularly healthful, but it tasted good. Marion was asked for an interview by someone from CBS Radio, so I took my leave and walked the few blocks to SoHo, to the opening of Lizarran, a new tapas place owned by a man from the southern Spanish city of Seville, who insists that all of the 200 some-odd tapas at the restaurant are Spanish. "No fusion,” he said. Indeed, it is part of an actual Spanish chain, with 200 units, according to its web site. I grabbed a glass of wine and a slice of Serrano ham, air-kissed food writer Kathleen Squires and said hello to food writer Margaret Shakespeare. Lizarran is a long, narrow restaurant that opens up in the back. It’s dark with red walls and it seemed to me that it might be a nice place to spend an evening with friends eating tapas, but after sampling a tasty little garlicky chicken open-faced sandwich I decided to let others enjoy the rather packed space and went around the corner to opening party number three, Beba. Beba’s intended to be more of a nightclub than a restaurant, really, but publicist Steven Hall said the chef, Tom Papoutsis, was a great talent who had yet to work at a venue where his cuisine could really shine. Maybe so, but, it being a Hall Company party, the crowd was beautiful and fun, the booze was plentiful, and the food was not so available. Steven knows I’ve said this about him before and he got me some meatballs and a bruschetta or two. But you can’t judge a restaurant by the food served at an opening party, and I think Steven knows that. You go to get a feel for the place and to just kind of know that it’s open. So Beba’s open. It has a front lounge and a middle bar area and a restaurant space in the back and then a bigger lounge downstairs. I was out of there some time before 9 p.m. I walked to Chinatown for a bowl of noodles and went home. 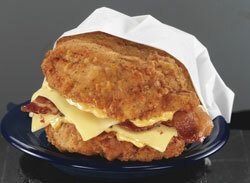 I guess I really should have gone to KFC to try a Double Down. I still have mixed feelings about this Otarian place but I guess I better visit since I work in the NYU area. I feel like there's something instinctively wrong when they try to mass market eco-friendly fast food since the two concepts don't seem to go together. It looks like they're just making money off of the green movement even if their intentions are good. "A trail of documents and emails show Dr Moghe was hired last year by Oswal Projects to tutor Oswal's 12-year-old daughter Vasundhara in Perth to help her win admission to the exclusive Lawrence School in India. But the company allegedly gained approval from the Department of Immigration and Citizenship for Dr Moghe to work as a chef -- and the working visa was granted on that basis. Dr Moghe, who has had a long career as a teacher in India, says he never worked as a chef while in Australia. Oswal said Dr Moghe had applied for a position as a chef with Otarian, the vegetarian restaurant business run by his wife Radhika, but admitted that he went on to work as a tutor while in Australia."